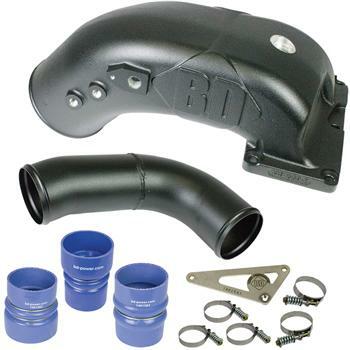 Improve turbo response and reduce boost pressure drop/loss on the stock intake system. BD’s Intake Elbow plenum is 74% larger with a 4-inch inlet and a full 6-bolt hole pattern compared to 5-bolt holes on other aftermarket elbows. Convenient ports have been added for connecting to gauges, water methanol injection and other injection nozzles. The arc of the intake allows for dual CP3 fuel pump kit installation. BD Diesel X-Intake Systems complete with adapting hoses, spring loaded clamps and flange gasket and a new 3.5-inch intercooler connection pipe which other kits on the market do not include in their pricing. The X-Intake Elbow can be directly installed onto the factory air intake grid or add the BD X-Intake Grid for superior air flow. The X-Intake Grid increase air flow with an opening that is 35% larger that is achieved by eliminating the restrictive stock cold weather intake air heater grid. A 2-hour swap if you need to the original grid for the winter.